The distinction between employees and independent contractors is important. The status of someone who works in your business makes a difference in how you pay them and in how they pay taxes. Employees (sometimes called common law employees) are paid as salaried or hourly, on commission, or a combination, and may be subject to overtime. Employees are taxed on their income (they receive a W-2 form showing their annual income), and you must also withhold federal and state income taxes and FICA taxes (Social Security and Medicare) from them. Your business must also make FICA tax payments. If someone is working for your business as an independent contractor, ​you don't withhold federal or state income taxes and FICA taxes from the amounts you pay them. Your business also isn't required to make payments for FICA taxes. The independent contractor must pay his or her own income taxes (called self-employment taxes), along with income tax on earnings. There is no overall one-shoe-fits-all way to know if a worker is an independent contractor or employee. The IRS looks at each situation on a case-by-case basis. But there are some guidelines the IRS uses. You can use those guidelines to see how your workers might fit into one or the other category. The IRS distinguishes between an independent contractor and an employee for the purpose of payroll taxes and withholding taxes. Basically, an independent contractor is an independent business person who runs his or her own business but who does work for another business. An employee is hired by a company to perform specific work at the direction of the employer. If an employer trains and directs work, including hours of work, what tools or equipment to be used, specific tasks to be performed and how the work is to be done, the worker is likely an employee. If the worker can set his or her own hours and works with little or no direction or training, he or she is probably an independent contractor. This factor includes how the worker is paid, whether the worker may work for others at the same time, and whether the worker can incur a profit or loss. A worker who is paid a salary is restricted from working for others, and who does not participate in company profits or losses, is probably an employee. The presence of a specific contract may indicate an independent contractor, but this factor alone is not controlling. If the worker is entitled to benefits, this would indicate an employment relationship. Another factor would be the type of work the person does; if it is directly related to the company's core work, he or she is probably an employee. For example, a maintenance worker would not be doing 'company' work if he or she were working for a bank. 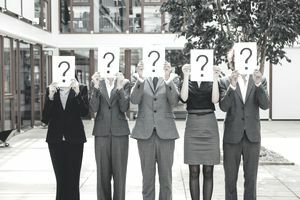 It is sometimes difficult to determine the status of a worker, but if you are unsure, assume the worker is an employee in the eyes of the IRS. If you want to find out whether to classify a worker as an independent contractor or employee, you can file a Form SS-8 (PDF) to request a determination from the IRS. The IRS doesn't issue determinations on hypothetical situations. it says that the Form SS-8 should be submitted "only in order to resolve federal tax matters." Neither the Form SS-8 determination process nor the review of any records in connection with the determination constitutes an examination (audit) of any federal tax return. See this IRS article on "Independent Contractors vs. Employees" for more details on the subject of independent contractors or employees. Just to confuse things, there is another possible status for workers, called a statutory employee (or non-employee). A statutory employee is a cross between an employee and an independent contractor; he or she is treated like a worker outside the company, but he or she is treated as an employee for employment tax purposes and like an independent contractor for income tax purposes. Some drivers who distribute (non-milk) beverages, meat, produce, or bakery products, if they are agents of your company and paid on commission. Piece workers who work at home on materials or goods you supply. You specify the work to be done and the goods or materials are returned to you. A full-time traveling or city salesperson, if the work performed for you is this person's principal business. The person turns in orders to you and the goods sold must be merchandise for retail or supplies used in the buyer's business. This IRS page on Statutory Employees has more details on the criteria for this status. The amount of initiative, judgment, or foresight in open market competition with other required for the success of the claimed independent contractor. the time or mode of pay does not control the determination of employee status.